With 4Easysoft Mac MP4 to MP3 Converter, converting MP4 to MP3 on Mac is extremely simple to do and usually only requires a small application. MP4 to MP3 Converter Mac is an excellent Mac MP4 to MP3 conversion tool which can not only convert MP4 to MP3 for Mac OS users but also convert MP4, MPEG4 HD to AAC, M4A, WMA, WAV, etc and other audios. With the MP4 to MP3 Mac you can freely enjoy the MP3 music from MP4 with the MP3 players. In addition, 4Easysoft Mac MP4 to MP3 Converter provides powerful editing functions, you can get the exact file with trim function, get any time-length clips from the source file, and specialize your player with the watermark function. Free download MP4 to MP3 converter for Mac to have a try. 4Easysoft Mac MP4 Converter is integrated MP4 converter for Mac software to easily convert nearly all popular video formats to MP4 on Mac. Apart from converting MP4 to MP3 on Mac, MP4 to MP3 converter for Mac can also convert MPEG4, MPEG4 HD to AAC, AC3, AIFF, AMR, AU, FLAC, MP3, M4A, MP2, OGG, WAV, WMA etc for Zune, iPod shuffle, iPod nano, iRiver PMP-100, Creative Zen Vision, iRiver, Sony MP3 and suchlike portable MP3 players. 4Easysoft Mac MP4 to MP3 Converter can output different formats for one video simultaneously, which brings great convenience to our users and make the conversion faster and easier. You can trim any time-length clips from source file exactly by setting the start time and end time manually. Using "Merge into one file" option, you can join more than one separated files into one file after conversion for you to listen successively. You can set all the audio parameters including Encoder, Sample Rate, Channels, Audio Bitrate for you to get the exact music. For the well-customized profile, you can save it as "User-Defined" for your later direct use. You can add pictures or texts for your video according to your own preference. 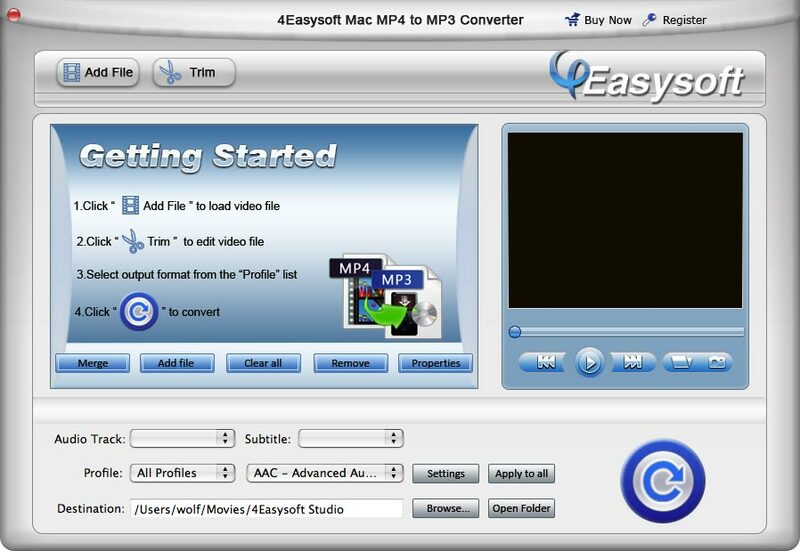 4Easysoft Mac MP4 to MP3 Converter gives access to revise audio track and subtitle of the movie. You can preview the effect of the converted file after you edit it with the help of 4Easysoft Mac MP4 to MP3 Converter. Capture your favorite picture while you view it in the previewing window. Armed with user-friendly and clear-navigation interface, MP4 to MP3 converter Mac only gives correct and necessary instructions in the refreshing interface for you to convert MP4 to MP3 on Mac in quick steps while maintaining the high sound quality to colorize your listening experience. Completely support dual core CPU, and provide the fastest conversion speed. New functions for you to add watermarks to your video anyway you want. Output different formats after one time conversion. Give access to revise audio track and subtitle of the movie.